Have you ever been shopping at a gorgeous boutique that was so entrancing you didn’t want to leave, not even when you got hungry? What if that wonderful store, offering antiques, clothing, jewelry, decor, and lots more featured a lovingly operated Brasserie crafting delicious, simple food with a Lebanese focus? Such a store exists here in Lafayette. It’s called Renaissance Market and Brasserie, and it’s in the Oil Center, convenient to Downtown and most other areas of Lafayette. Jim Hopkins operates the market and restaurant, which has been in business for 26 years and in its current location since 2008. His team works tirelessly to source the goods for the market, and it shows. 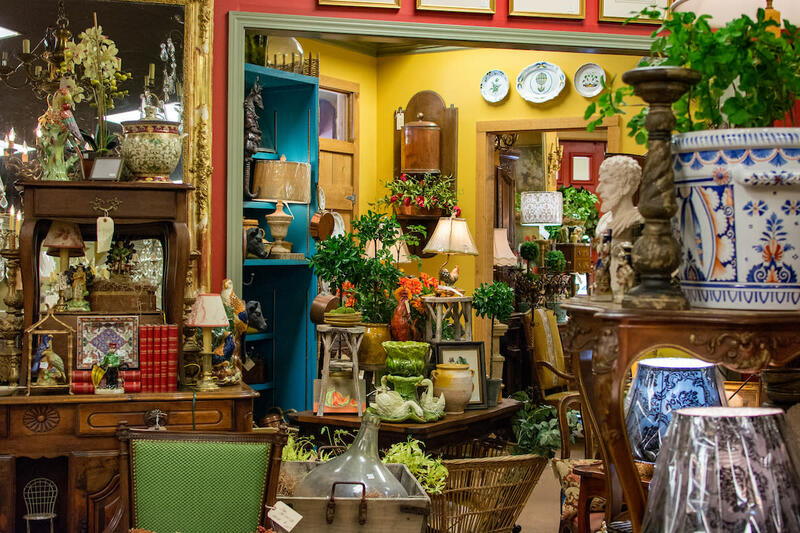 It’s an ample space with unique treasures at every turn. As for the restaurant, it’s at home in its setting, nestled in the market offering lunch, wine, and prepared meals to go. Jim says that his idea for the Brasserie was to create a destination that would serve the Oil Center, and for it to fully complement the market, a liquor license was vital. He wanted to offer wine and other beverages so that restaurant patrons and market guests alike could either “drown their sorrows or toast their successes.” Of course, the wine is available to purchase off the shelf as well, but because the establishment is a restaurant, they can offer selections not carried by other wine markets. There are lovely sandwiches: A Tuna Melt on Nine Grain Bread; a Four Cheese Grilled Cheese Sandwich to which you can add ham, turkey, bacon, bologna, or chicken breast; another sandwich offering a choice of Chicken Salad, Turkey Salad, or Tuna Salad on your choice of bread; and a Bacon, Avocado, Lettuce, and Tomato sandwich on toasted sourdough. 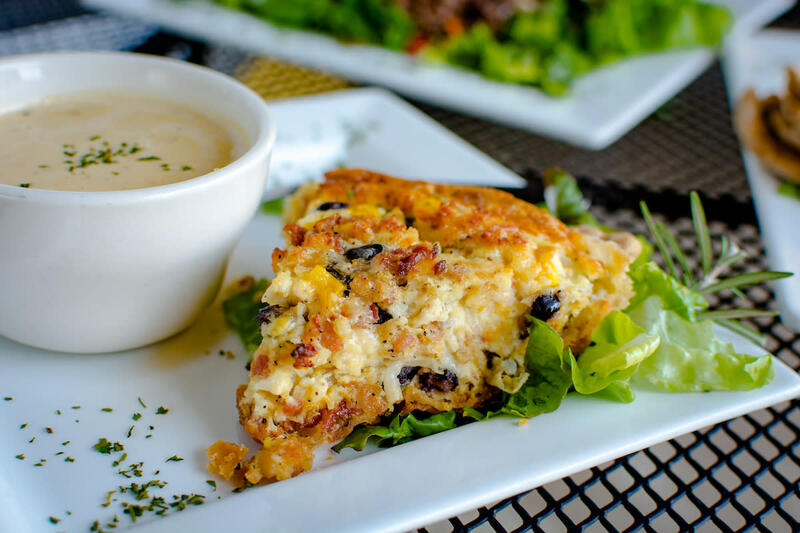 There is also a Soup du Jour offered in cup and bowl sizes, the former of which can be combined with a salad or a half chicken salad sandwich. 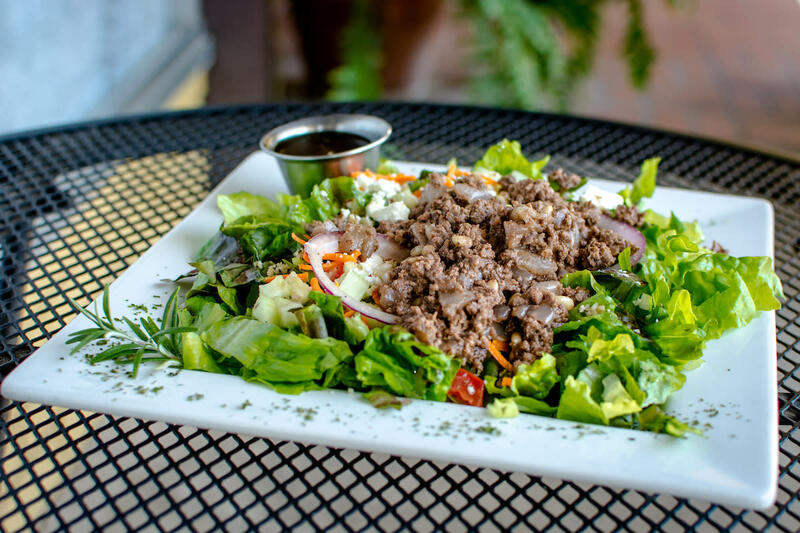 The salads are light and fresh, and this is where the Lebanese influence, derived from Jim’s Mother-in-Law’s cooking, begins to show. 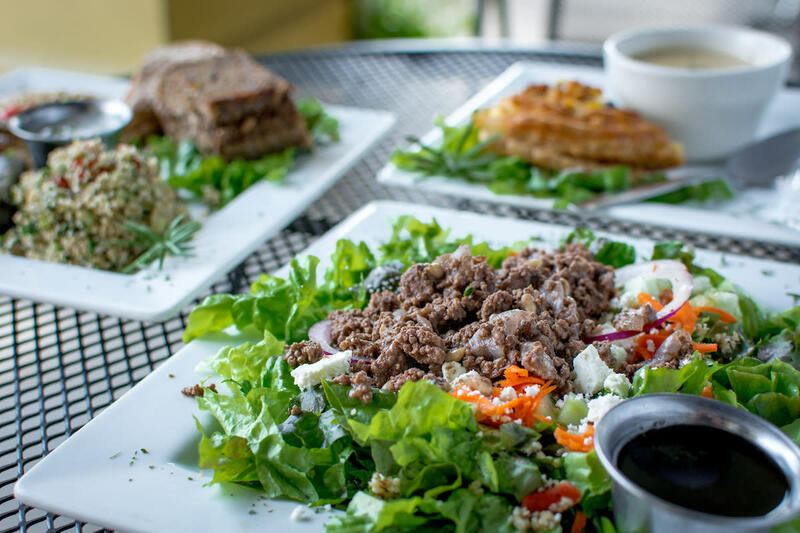 There’s the Hashwit (like Kibbe before its made into fritters) and Salad including mixed greens, tabouleh, pine nuts, purple onions, and more, all with a balsamic vinaigrette. The restaurant offers two sizes of their Feta Salad, and you are invited to add grilled chicken. The star of the show is the Lebanese offerings. There are Grape Leaves, Hummus, Hashwit, Kibbe, Tabouleh, and Pita. 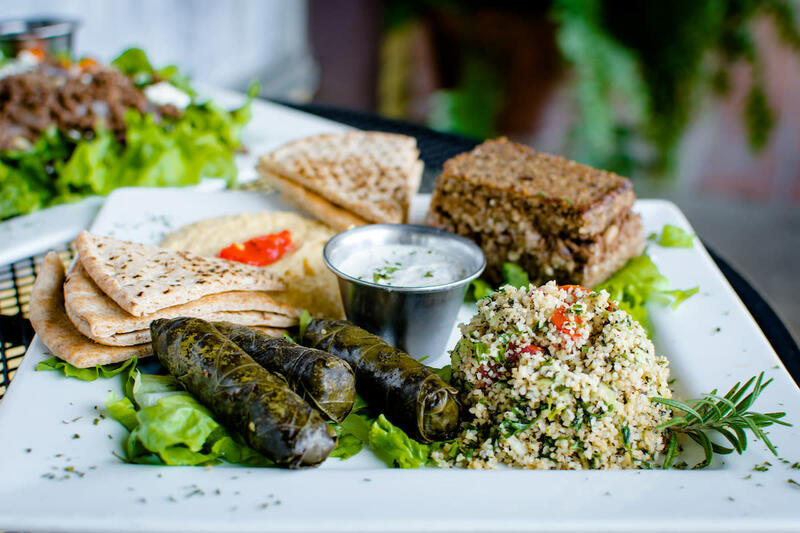 They are available in a Lebanese Sampler, or you can opt to “Build Your Own Lebanese Plate” by ordering the items a la carte. When Jim talks about these favorite foods on the menu, he doesn’t hold back. 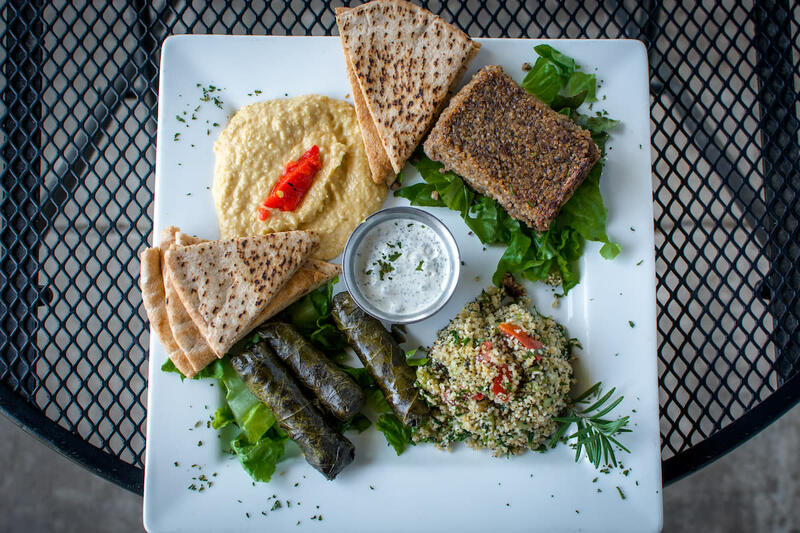 “I have to have Grape Leaves, Kibbe, and Hummus,” he says, and he means every day. The Brasserie also has plenty to offer its guests to entice them to come back. Each weekday has a list of specials, from four to six each day. Some of the items are simply fresh takes on items from the regular menu like Wednesday’s Hashwit Wrap, while others are complete originals like Thursday’s Asian Salad featuring grilled chicken, mandarin oranges, and almonds with a toasted sesame dressing. The prepared meal offerings are great for easing the execution of dinner for the family after a day of shopping, or for adding a special course to a dinner party. There are all manner of items ready for pickup at any given time. The Lasagna and Gumbo are hits, but there are plenty of options. Be sure to grab a bottle of wine to pair while you’re there. 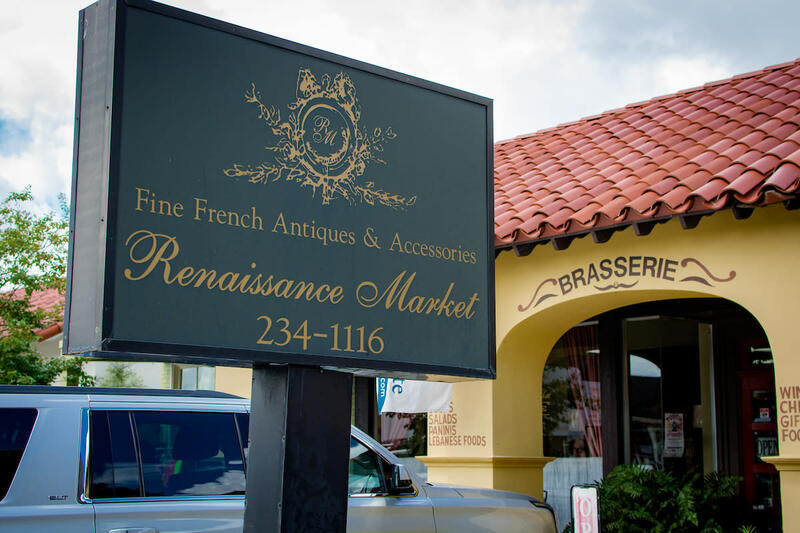 Renaissance Market and Brasserie is located at 902 Harding Street in the Oil Center in Lafayette. The market is open from 10:00 a.m. to 5:00 p.m. Monday through Friday and from 10:00 a.m. to 3:00 p.m. on Saturday. The Brasserie is open for lunch from 10:00 a.m. to 3:00 p.m. Monday through Friday and from 10:00 a.m. to 2:00 p.m. on Saturday. Be sure to stop in for your next shopping day, and if you get hungry, you won’t have to go far. In fact, you won’t have to go anywhere at all.